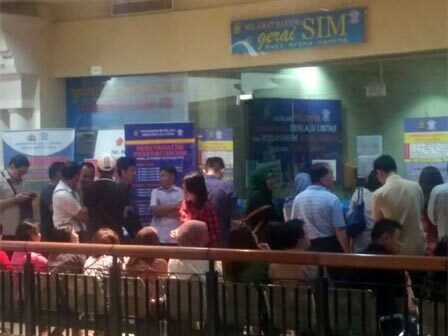 On the first day of work after Eid holiday, four Samsat booths in North Jakarta serve 360 people for vehicle tax (PKB) administration, Thursday (6/21).
" Generally service is running normally with normal amount of taxpayers"
North Jakarta and Seribu Islands Taxation and Regional Retribution Sub-Agency's Vehicle Tax and Vehicle-Ownership Transfer Fees (PKB-BBNKB) Unit Head, Robert Lumbuan Tobing said, Samsat booths in Artha Gading, Pejaringan Sub-district, Pluit, and Pasar Pagi Mangga Dua have served people normally. He explained, there are 161 taxpayers who came for PKB service in Artha Gading Samsat booth, 100 taxpayers in Penjarangan Sub-district, 71 taxpayers in Pluit, and 28 taxpayers in Pasar Pagi Mangga Dua Samsat booth. "Generally service is running normally with normal amount of taxpayers. But number of taxpayers in Artha Gading is relatively increased," he conveye d.